Good For Michigan will recognize eight businesses at its second annual awards ceremony on April 16, 2019, at the Aquinas Performing Arts Center from 6:30-8:30p.m. These businesses are among more than 100 across the state who have taken the Quick Impact Assessment, which measures the company’s social, environmental, and economic impact. Out of the eight top-scoring businesses, four will be selected as the winners in one of four categories, including Governance, Environment, Employees, and Community. Grand Rapids Mayor Rosalynn Bliss will share remarks about the City’s involvement in the program and the importance of ethical business. 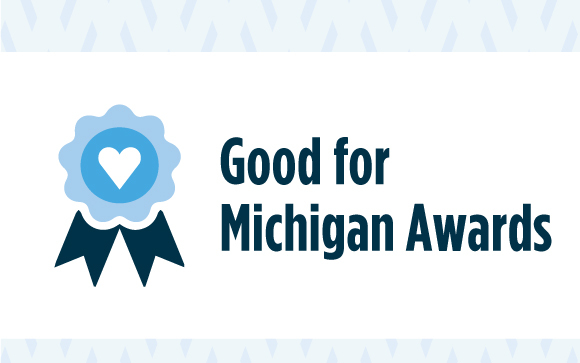 Community members and business owners are invited to celebrate the Good For Michigan Award recipients at a reception on Tuesday, April 16. Tickets are $45, $40 for businesses who have taken the QIA. Ticket price includes heavy appetizers and an open bar. Good For Michigan is a program of the Local First Educational Foundation. This initiative offers resources and best practices for sustainable and social good. We curate educational programming and convene values-aligned businesses that strengthen our economy, create equitable opportunities for our workforce, and work towards a healthier planet.